I use wastefulness left in the world as a tool in my work. I try to respond to the symbiotic relationship that exists between humanity and its material environment. Through a performative video installation at La Centrale, Sydney artist Justene Williams brings together high and low art, history and salvage, painting and video, in a hypnotic new form of recycling – a curiously “carbon neutral” method of image production. Her practice attempts to conjure the spirits of the overlooked, female art figures such as The Baroness Von Loringhoven, Sophie Tauber Arp and Valentine De St Pont. 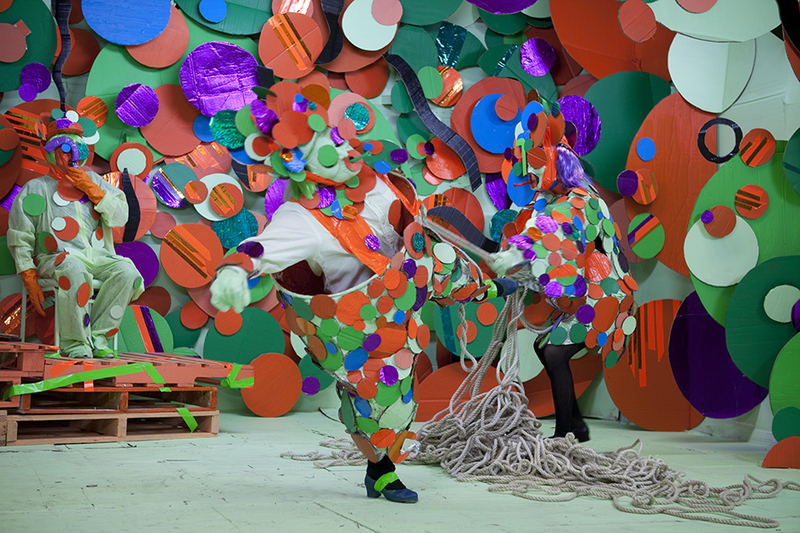 Trained as a child in dance, Williams employs video as a performative medium, creating elaborate sets and costumes from “waste” materials, in which absurd and repetitive actions are executed. Justene Williams’ work encompasses video, photography and performance. In recent work Williams has constructed elaborate sets and costumes made from collaged paper and a variety of “waste” or refuse materials. In these complex and fabulous environments she performs absurd actions in an attempt to reconstruct the essence of lost images (both from her personal archive of photographs and from the annals of art history).